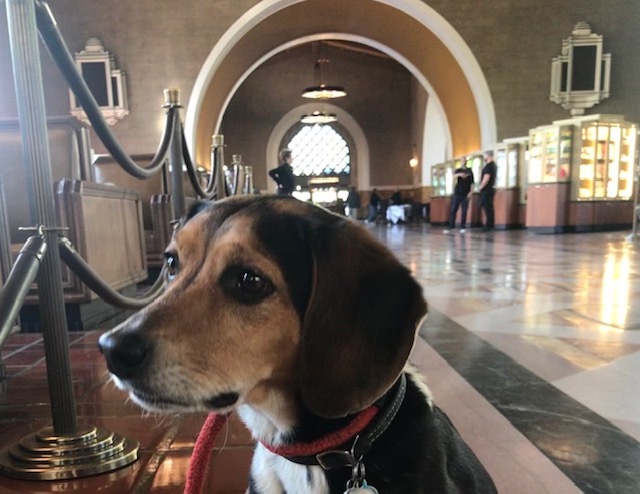 Seeking respite from the Los Angeles sun, Fred cools down in Union Station, the art deco masterpiece. Fred and I spent the other morning navigating through downtown LA while my car’s air conditioning was being serviced. 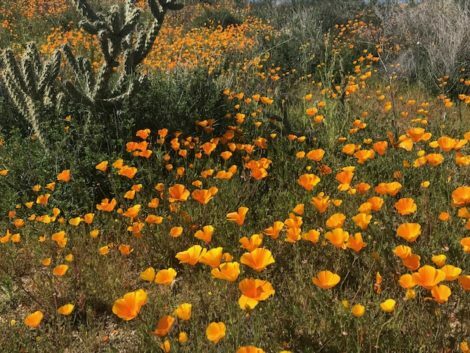 (Not having it function in the Mojave Desert on our drive west is a story in itself. I will never again leave on a winter trip from the north without having it tested.) First the hot car in the Mohave and then the walk around hot, dusty downtown, looking at all of the renovation and construction being done there, made me appreciate something I rarely thought about before: shade. As we traversed the city, we found respite from the heat in various ways. Fred and I revived ourselves in Union Station, where the cool floors provided respite for Fred from the heat outside. From there, we judiciously crossed to the shady side of the streets as we headed down the cement sidewalks of Chinatown, and then stepped into Phillipe’s for Fred’s first French dip (a favorite food of mine from a favorite haunt dating from my days living in LaLa Land), and then headed off in search of the Disney Center, its stainless steel glow in the distance leading us forward. 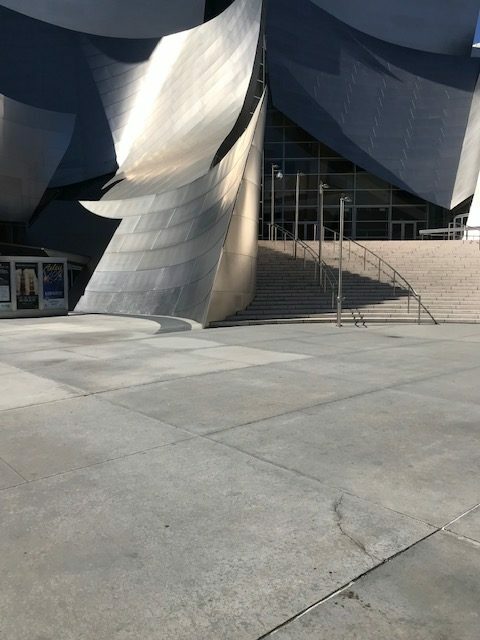 Disney Hall is a shining sculpture as one approaches it, but it does little to mitigate the heat of a sunny, hot spring day in Los Angeles. 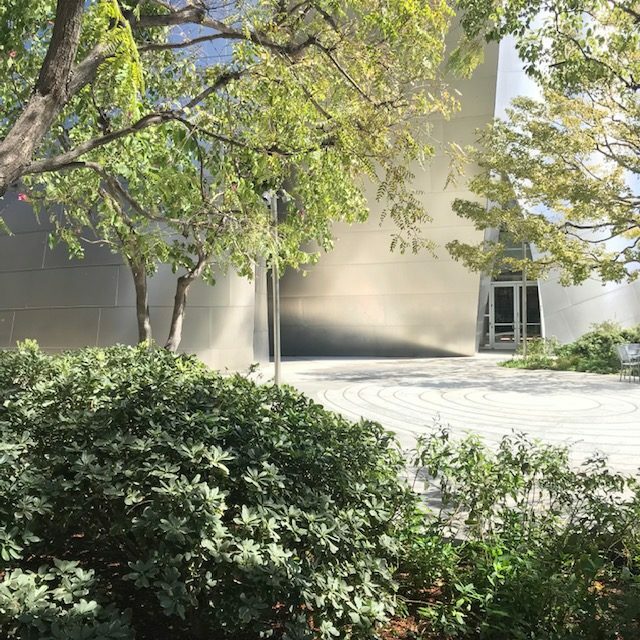 At a distance the form and sheen of the Disney Center were striking, but its reflective glow also seemed like it could emanate heat despite the cool curves of the design that identified it as signature Frank Gehry. 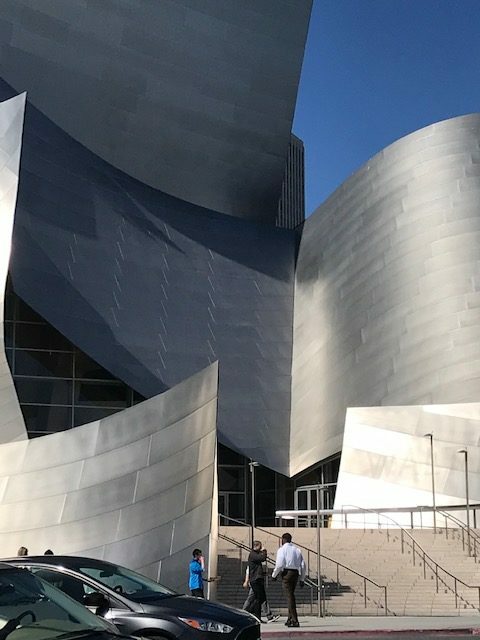 I know that Gehry spent considerable time planning the views of the design from all angles, but it struck me that he must have done so on a cool day or from an air-conditioned car. Otherwise he would have surrounded the building with cooling trees, which of course would have ruined the view of it from down the block. 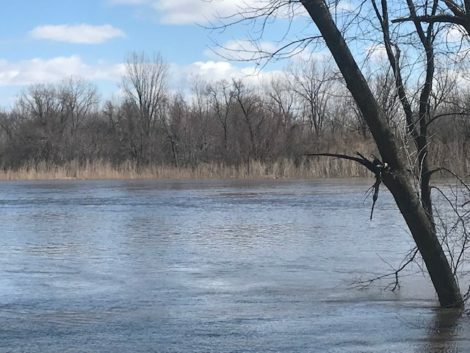 Its presence is its strength and its strong lines draw one forward to it, but I couldn’t help but wish for some respite from the sun. The Blue Ribbon Garden at Disney Hall, attained by this staircase, truly deserves its name. The whole building is a stunning piece of sculpture that reflects the heat. While the wings that give the building its form do cast a minimal amount of shade, it was not until we climbed a side staircase and discovered the Blue Ribbon Garden on a terrace along the west side of the building that I appreciated the true genius of Gehry and the landscape architect Lawrence Moline. Tucked away, with approaches that show off the sculptural form of the building with each step, this garden was just what Fred and I needed. The trees and undulating beds of this garden, with their gentle contours, provide shade and the illusion of shade. 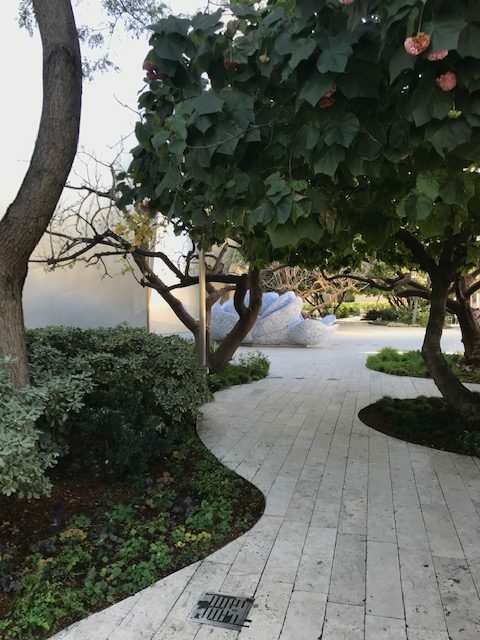 The tree-filled garden has beds reminiscent of the gentle curves that Brazilian landscape architect Roberto Burle Marx often created, as well as the gentle crescendos of music that would emanate from the building. Art, architecture, music and nature seemed to have formed a quartet. From our perspective on a hot day, it was most important that the site was created with wonderful trees, selected so their forms would complement the building. And beneath them were simple plantings of sage and quiet ground covers that do not compete with the building. 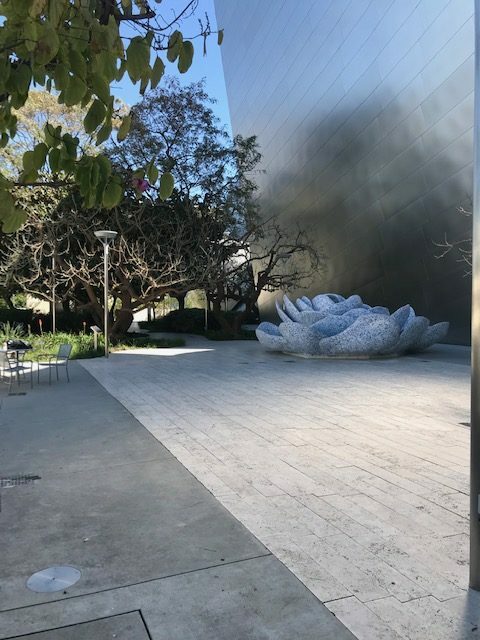 A giant flower-shaped sculpture honoring Lilly Disney, formed from broken pieces of blue and white china, added to the coolness of the site, like a water lily floating in a pond. This sculpture’s artful form connects that garden to the building, and its blue and white tones seem to provide a cooling presence, like a pool of water. The trees felt like sculptures and cast their shade and shadows in as artful a manner as the building itself. It was a rare moment when architecture and garden design seemed in perfect harmony, and the coolness of mind allowed me to take it all in. For what is a great building if it does not offer a roost from which one can truly and comfortably appreciate it? This site is an ideal spot from which to take in the garden and the building.